UPDATE (11/22/08) I wanted to highlight the comment from Ben Glass, a respected and successful personal injury/medical malpractice attorney in Virginia and also the founder of GreatLegalMarketing.com which offers effective, ethical and out of the box marketing techniques for personal injury attorneys. Ben has been successful in large part because he has found ways to help lawyers promote their practices and educate prospective clients while remaining within the confines of today’s ethics rules. Unfortunately, the more success we find within existing rules, the possibility increases that the “old guard” in the bar will try to change those rules to its advantage. Why else would bars try to claim that blogs are advertising? Blogs educate clients – and you’d think that the bar would want to promote education. But because blogs enable solos and small firms to gain market share, they may pose a threat to the existing regime. Poke the surface of the legal blogosphere these days, and you’ll find talk of change bubbling below. Over at Law in the Twenty First Century, Nicole Black is leading the charge, with her three pronged manifesto about how the recession, Gen Y and the new administration make progress inevitable in the legal profession. 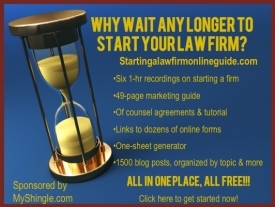 After five years of blogging about his own personal efforts to change the way law is practiced (among them, leverage technology and dump the billable hour), Enricho Schaefer at Greatest American Lawyer reports that he’s finally seeing a light at the end of the tunnel and urges like minded lawyers to join the fight. Jordan Furlong’s entire Law 21 blog is a running message of how the legal profession must change, or if not, will suffer the consequences such as squandered talent. Believe me, I want to see the profession change, and things have come such a long way in my now fifteen years as a solo. But from where I sit, change isn’t spreading quickly or pervasively enough. Most of the lawyers I speak with from so-called top schools still don’t consider solo practice as an option, and would rather quit the law for another profession than hang a shingle. My own law school hasn’t even stocked my book Solo by Choice in the placement office. And I still find it difficult to get biglaw partners to return my calls asking to chat about new trends in our respective practice area. But my cynicism doesn’t just flow from my own personal experience. It’s more than that. Though we may teeter on the brink of progress, we’re still not close to going to the other side. And I know that, because the bars have not yet begun to fight. Before we enter a new historic paradigm in the legal profession, we will face one last hurdle. The bar associations, either by inertia or intent, will retain antiquated rules or practice, or worse, try to introduce new ones that will erect barriers to progress. If you don’t believe me, consider the evidence. A few years back, the Florida bar told an enterprising New York lawyer living in Florida that he couldn’t serve other New York “snowbirds” because he wasn’t a member of the Florida bar. Sounds benign – but consider the impact on a virtual law office. What if an Alabama barred attorney moves to Texas with her spouse and wants to use technology in a Texas home office to serve Alabama clients only. Would the bar allow it? Doubt it (I know that Maryland doesn’t allow this kind of arrangement, and indeed, if the Maryland bar discovers you’ve been handling DC cases from a homebased office, it could complicate your ability to gain admission to Maryland down the line). What about a group of independent lawyers who decide to set up a common blog network jointly market for clients, then refer them to the attorney most appropriate to handle the case? Will bars start arguing that this practice violates the ban on paying for client referrals (well, unless the bar refers them and then it’s OK)? It’s not so far fetched — again, the backwards Maryland bar won’t let lawyers join networking groups like BNI because of concerns that lawyers may run afoul of the prohibition on receiving something of value in exchange for a referral. The point is that as technology enables collaborative efforts between small firms, look to large firms or bar associations themselves to challenge those practices. Recall New York’s proposed advertising rules that would have defined blogs as advertising, thus triggering onerous requirements such as retaining print copies or even seeking bar approval prior to making a change (obviously, a death knell to regularly updated blogs). Fortunately, a large chunk of the rule was found unconstitutional, but it took a court battle to win invalidation. For some time, I’ve been surprised about how restrained the bars have been with respect to regulating social networking. Initially, I thought that the restraint derived from a willingness to let the technology and the mores evolve organically and to trust lawyers’ judgment to do the right thing. But now, I’m more cynical – I think that the bars haven’t yet touched social networking because to them, these uses are just a frivolous form of entertainment, rather than a powerful tool for building relationships and reputation, marketing a practice and improving our ability to serve clients. Once the bars and larger firms understand that these new technologies can level the playing field between newer lawyers and established firms, they’ll figure out a way to change or interpret ethics rules to prohibit these practices. I’m not saying that change won’t happen. But if it’s going to, it won’t be easy, and we must stand ready to challenge the bar. Are you up for a fight?